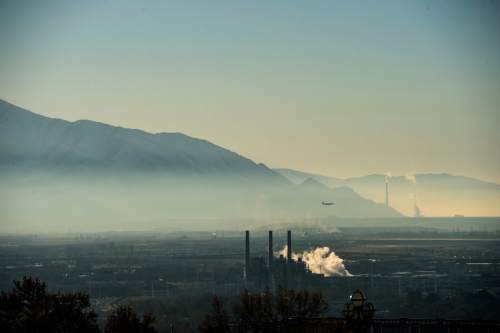 Chris Detrick | The Salt Lake Tribune An inversion over the Salt Lake Valley on Tuesday, Dec. 1, 2015. A pair of bills intended to update basic elements of the state&apos;s guidelines for handling environmental infractions inspired a lengthy debate Wednesday about how environmental offenders ought to be punished. A bill that would give the state Department of Environmental Quality more time to prosecute environmental offenses won a last-minute favorable recommendation from a senate committee despite concerns that extending the statute of limitations would allow the DEQ to dig up old problems. But a proposal to increase the maximum penalties for violations of the environmental code stalled after the committee questioned whether it was a money-grab by environmental regulators. Sen. Luz Escamilla, D-Salt Lake, sponsor of both bills, described them as simple adjustments to the environmental code. The state&apos;s maximum fees have not been updated since 1981, she said, and SB66 would have adjusted the fee schedule for inflation. The other bill, which would have extended the statute of limitations on environmental violations from one year to five, would give the DEQ more opportunity to pursue action against environmental offenders, she said. Bryce Bird, the director of the state Division of Air Quality, testified that his division has only enough inspectors to visit regulated industrial sites about once every three years. Under the current statute of limitations, he said, the division is unable to pursue action when inspections turn up environmental infractions that occurred more than a year before the inspection date. "This can lead to times when we can&apos;t actually enforce provisions of the code," he said. Environmental advocates spoke in favor of the measure, saying it would impact only bad actors and would make dodging environmental rules and permit requirements more difficult. But industry representatives questioned whether changing the statute of limitations would address the real problem. "Are we seeing a continual pattern of violating companies that the DEQ is not able to get back and check?" said Todd Bingham, president of the Utah Manufacturers Association. "It sounds like this is an issue of funding for the DEQ, if that&apos;s what we&apos;re addressing  that the DEQ can&apos;t get out and inspect." State lawmakers worried the bill would allow the DEQ to go back through company records and seek out problems for prosecution. "The testimony we&apos;ve had talked about your labor and looking for a problem," said Sen. Scott Jenkins, R-Plain City. "It appears to me that all the simplicity of this does is allow you to go back to five years if you find an infraction. It doesn&apos;t change your labor or the amount of times you visit." After an attempt to cut the bill&apos;s statute extension from five years down to three, a motion to pass the bill failed 3-4 and Sen. Margaret Dayton, R-Orem, made a quick-fire motion to end the discussion and proceed with the agenda. But just before the last item on the committee&apos;s agenda, Sen. Jani Iwamoto, D-Salt Lake City, resurrected the bill with a similarly speedy motion for an amendment parsing the statute extension from three years to two  drawing protests from other members of the committee, who questioned whether such a motion was in order. Despite the clamor, the amendment passed, as did a subsequent motion for a positive recommendation, which passed with a single no vote from Dayton. Escamilla&apos;s second bill had less success with the committee, whose members questioned whether the sizable penalty increases were warranted. Among the largest increases suggested by the bill were the penalties for criminal environmental infractions  instances when an entity harms the environment knowingly or willfully. The bill upped the bas rate from $25,000 per day to $65,000 per day. Subsequent violations could cost as much as $130,500 per day. Ingrid Griffee, a representative of Utah Moms for Clean Air, argued that large fines are a necessary deterrent that would disincentive pollution without impacting businesses that abide by the law. But Dave Jorgensen, who described himself as a private businessman, pointed out that at the suggested rate, it would take just a few weeks of noncompliance to rack up a million-dollar fine. He characterized the bill as an attempt by the DEQ to "grab up money" in order to fund itself. The committee ultimately voted to take no action on the bill on a motion made by Sen. Evan Vickers, R-Cedar City, after he said the suggested penalties should be more carefully considered.